SAN DIEGO (AP) — After playing five games in 11 days, the No. 24 San Diego State Aztecs looked tired against Washington. A second-half surge changed all that in a hurry. Following a sluggish first half, in which the Aztecs trailed by nine at the break, San Diego State rallied for a 70-63 win on Sunday. 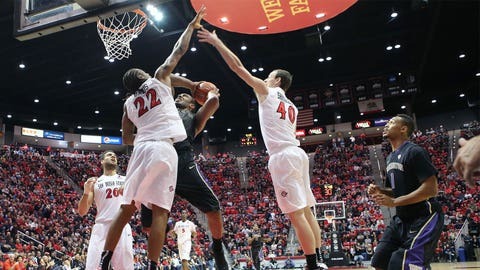 Xavier Thames scored 19 points, and Winston Shepard added 17 for the Aztecs (7-1), who won their sixth straight. "We shot about as poorly in the first half as we ever have, but we still played defense," Aztecs coach Steve Fisher said. "We didn’t let them run away and hide. In the second half, we got some shots, and the defense got even better." C.J. Wilcox led Washington (4-4) with 17 points. Nigel Williams-Goss added 14 for the Huskies. San Diego State kept it together until it got its second wind in the second half. "We were just exhausted," Shepard said. "We were getting some good looks, we just talked about finishing, but I wouldn’t say there was any desperation." The Aztecs opened the second half with a 17-2 run, taking the lead on a jump shot by Thames with 14:59 remaining. JJ O’Brien scored five straight points during the run. "We all missed our shots, but we didn’t hang our heads," Thames said. "We talked about coming out strong in the second half, and that’s what we did." Washington didn’t make a field goal in the second half until Wilcox hit a three-pointer with 12:49 left. "We were trying to pack it in," Huskies coach Lorenzo Romar said. "I thought we did a good job in the first half of staying tight defensively. The second half, I think (San Diego State’s) pressure bothered us a little bit." Wilcox gave the Huskies a brief 42-41 lead with a layup with 11:21 remaining, but San Diego State scored six unanswered points, capped by Matt Shrigley’s three-point shot, to build a 47-41 edge. "They gained a little momentum," Romar said. "We started to chase them more on the perimeter, and they started to drive to the basket more and made us pay." The Huskies pulled within 65-63 on a three-pointer by Williams-Goss with 29 seconds remaining, but Shepard sank two free throws to preserve the advantage for the Aztecs. Skylar Spencer blocked five shots to establish a career high and lead San Diego State’s defensive stand. "It feels real good," Spencer said. "We have been playing hard and practicing hard every day. It will be nice to take a little break." Washington built a 30-21 lead at the break as San Diego State shot just 28 percent from the field, including 1-for-7 from three-point range. The Aztecs extended their 42-game winning streak at home against non-conference, unranked opponents, and have won 12 of 14 games against current Pac-12 conference members.